First and foremost - a gigantic, enormous, astronomical THANK YOU to youz lot for all the lovely messages, comments, tweets, everything since the release of our brand new pattern, the Anna Dress. We had a sneaking suspicion she'd be well received (we've been swooning hard ever since our first sample), but as usual, you guys have gone and overwhelmed us with all the love, once again. Thank you. We really, really appreciate it. So what is stay stitching? It's basically just a line of wide machine stitching along the raw edge (about 10mm in from the edge) of your fabric, usually along a curve that you don't want to stretch or 'give' before you get to seaming it. Now, we'll be the first to admit that we rarely actually do this... But if you're using fabric with a relatively loose weave, or any kind of stretch, then stay stitching will only make your life easier later on. So do it. And we'll start practicing what we preach! 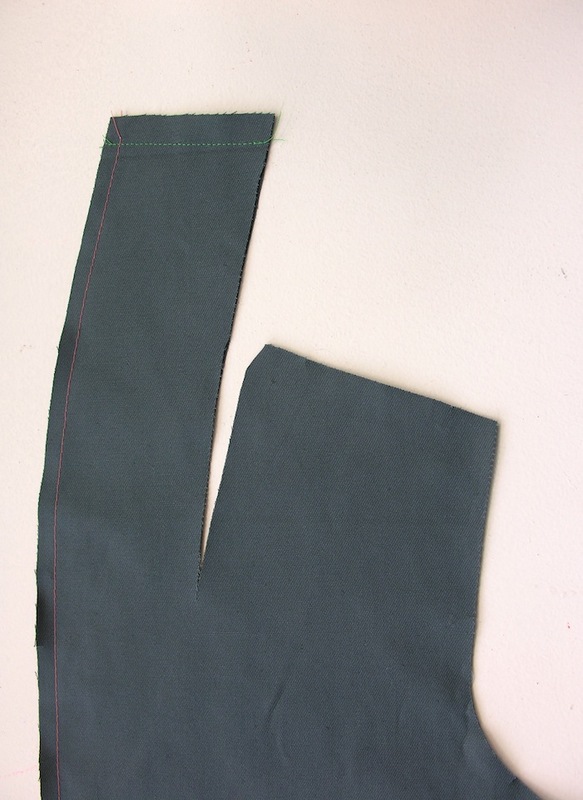 At this point, we recommend finishing off these raw edges of excess seam allowance. You can do this on an overlocker/serger, or if you don't have one of those (seriously good investment though girls - try smiling sweetly at your lover/folks/friends...!) 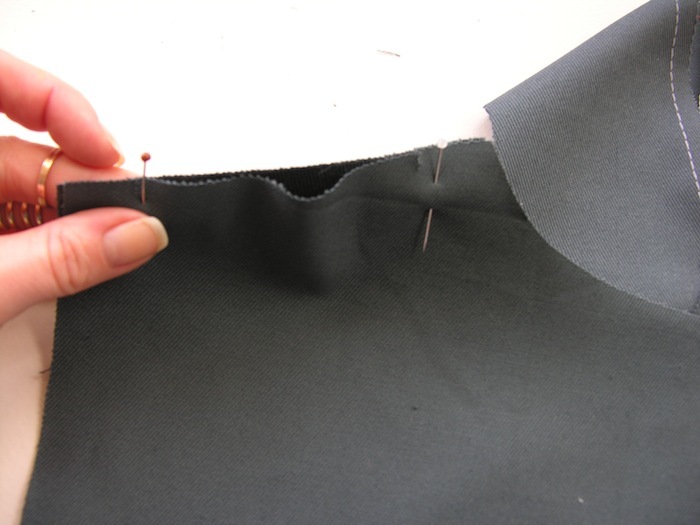 you can always secure the raw edge by going over it with a zigzag stitch or some machines even have a mock-overlock stitch. Failing that, you can never go wrong with a good ole pair of pinking shears (zigzag scissors) to trim away the excess. Pretty standard situation here - simply joining the front to back (right sides together!) at the shoulder seams, only for this blazer it's important to remember that we've included a little excess ease on the back piece. 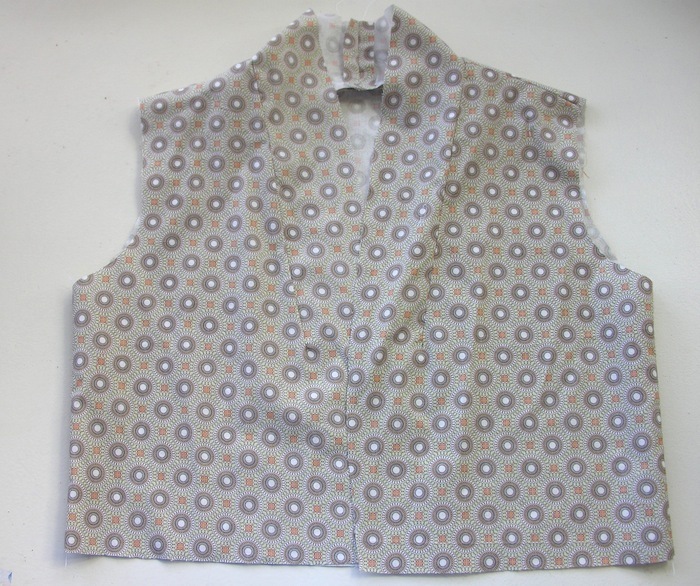 Pin the front and back pieces together at the notches on the shoulders and just gently stretch out the slightly shorter front shoulder as you stitch. 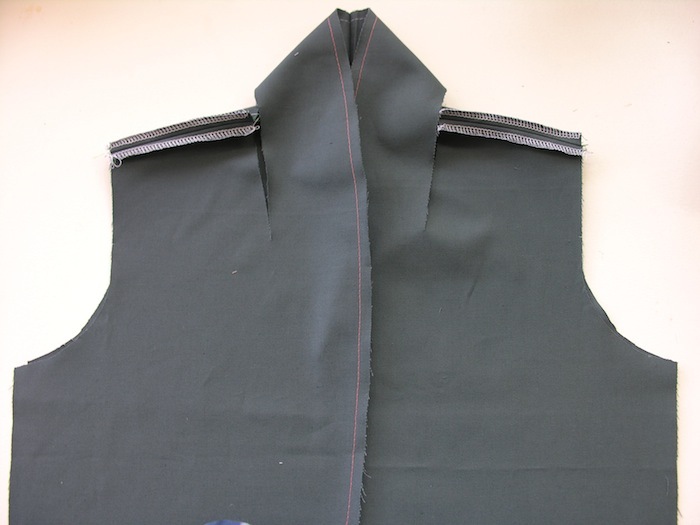 Press the shoulder seams open and finish as you did before. At first glance, you'd be forgiven for feeling slightly daunted by that front dart/neckline seam all-in-one going on there... But have no fear ladies! It's surprising easy, and amazingly slick. 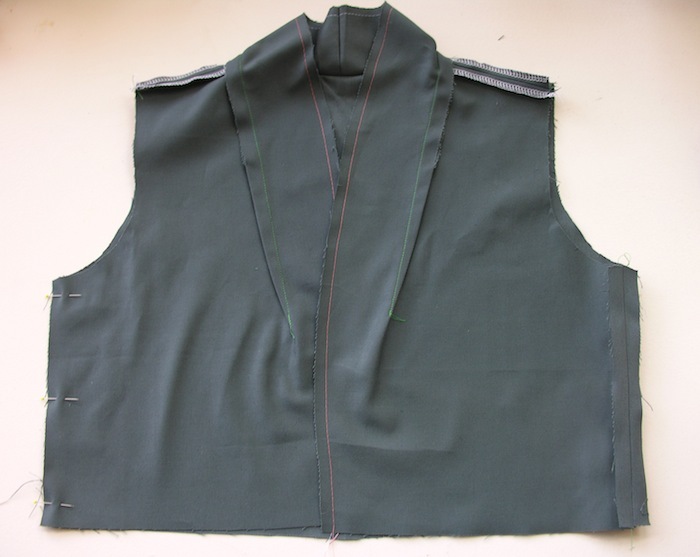 With right sides together, pin the neckline matching the notch at centre back of the back piece to the centre back neckline seam, matching notches on the front neckline pieces to the shoulder seams, and continue to pin down to the start of each dart. 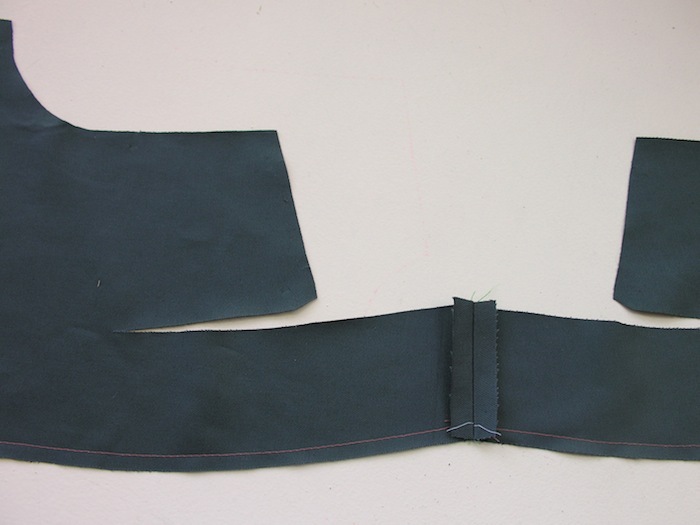 Start your stitching from the beginning of the dart on the centre front piece shown on the left hand side in the image above. 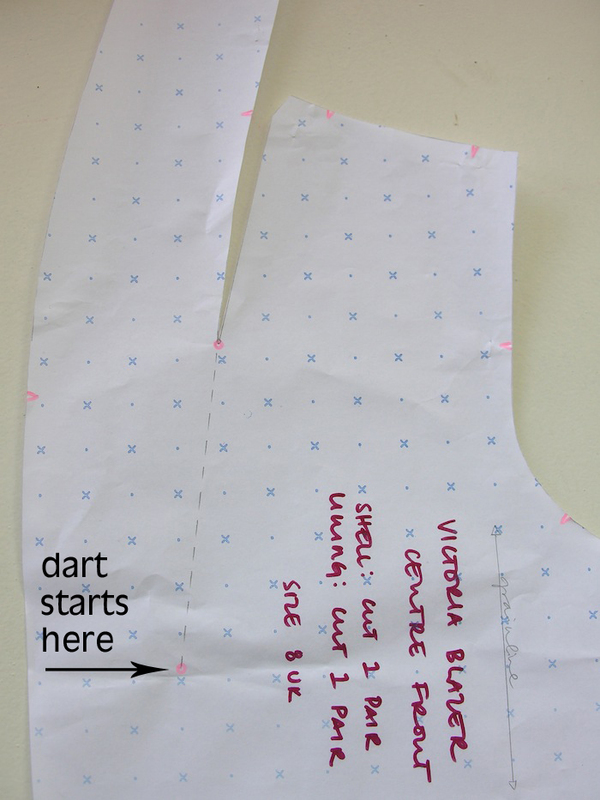 When the dart stops being a fold and hits the raw edge of the neckline, you should be stitching with your usual 5/8", or 15mm seam allowance. Ease around the curve at centre back, and continue until you've reached the end of the dart on the other side. Last on our agenda for today folks - closing the side seams. This is applicable to all linings, and for the cropped variation 2 shells ONLY. 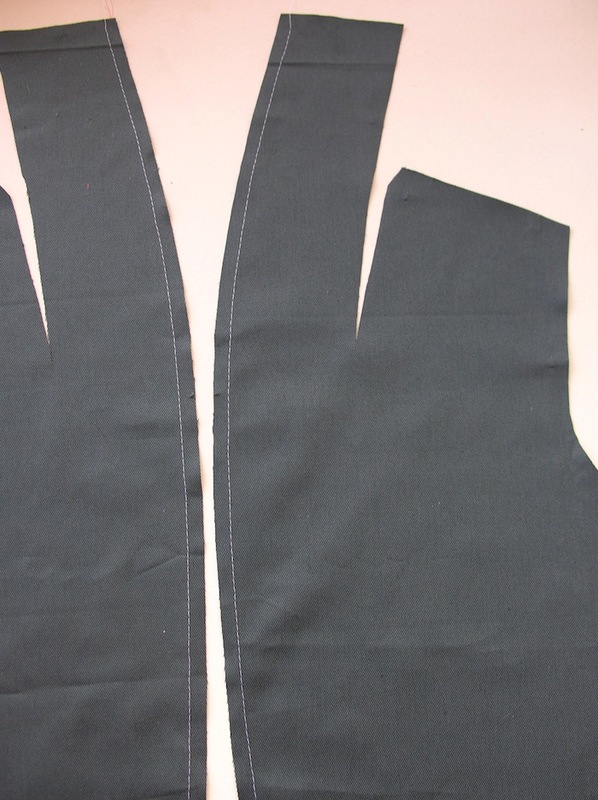 Those of you making the main or sleeveless variations, basically anything with pockets, can skip this part for your blazer shells and get started on your linings (see below). Now all you gotta do is scroll back to the top of this post and repeat everything for your lining pieces... And you're done for the day! 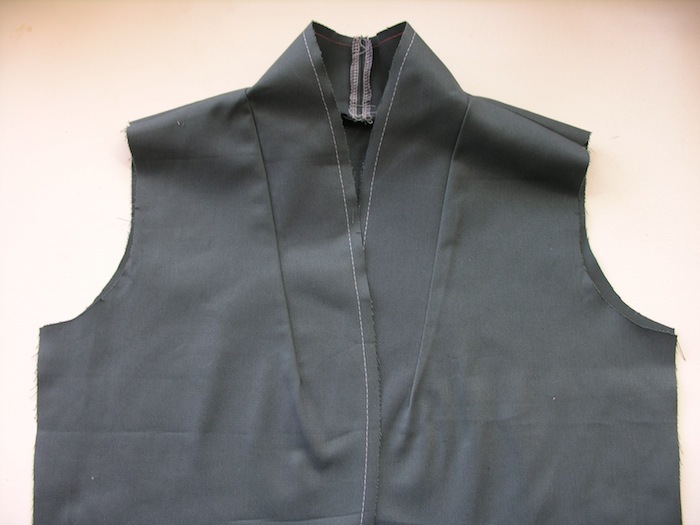 We'll be seeing you again early next week when we'll be setting in the pockets and prepping the collar and lapels... 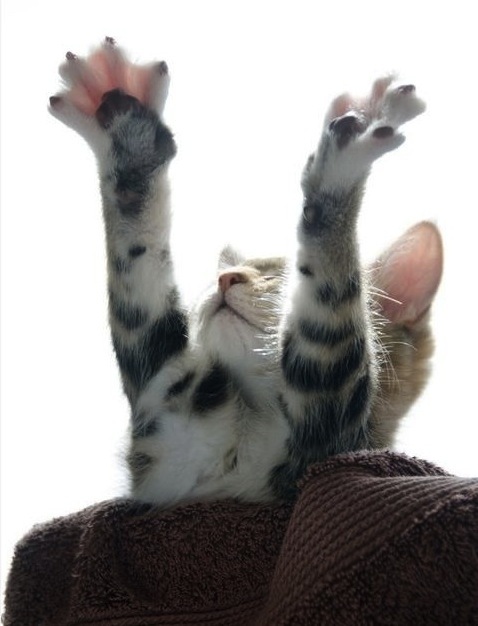 In the meantime, have a wonderful wonderful weekend guys, and don't do anything we wouldn't do...! 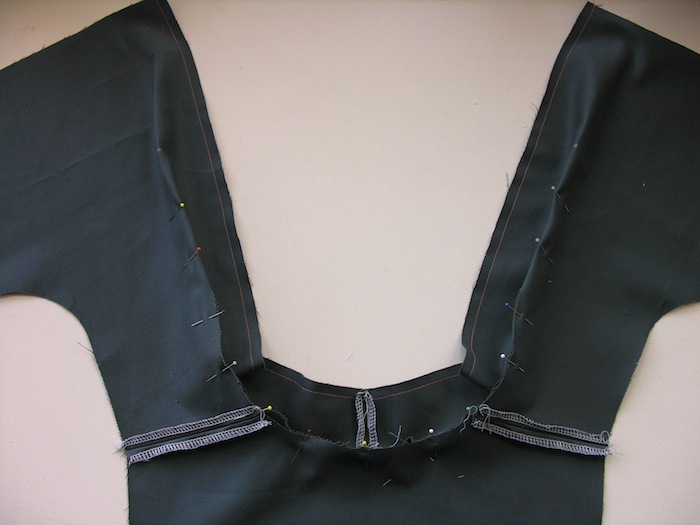 You neglected to mention that stay stitching should be done from the outer edge of your garment piece in towards the center. 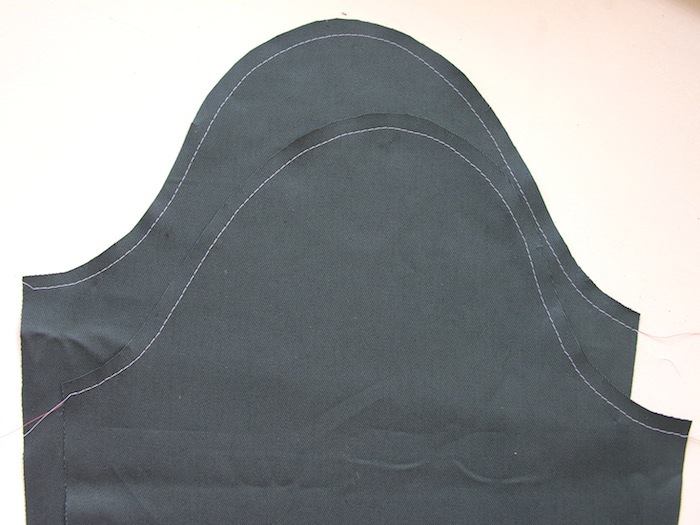 This further minimizes any stretching or distortion of a garment piece that is on the bias. 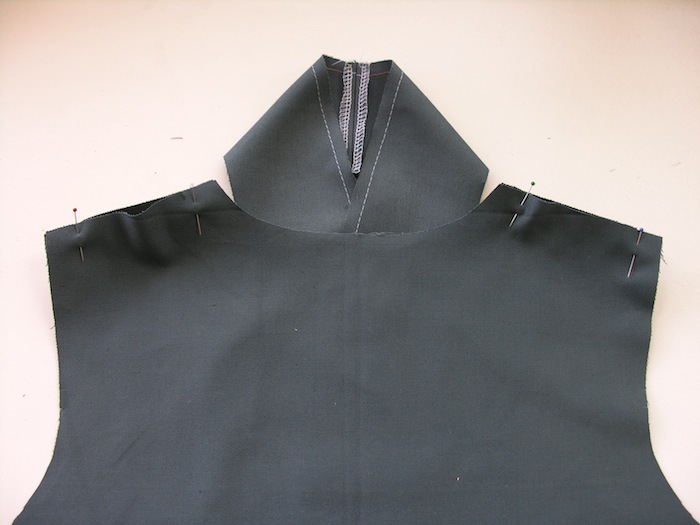 On the sleeve head, for example, I would start stitching along one edge going inward and stop at the center without backstitching. I cut my threads, then flip my piece over to the opposite side (right or wrong side of the fabric as the case may be) and repeat the process. Now I have two lines of stitching that meet in the middle. It really does make a difference! Very excited by how it’s looking already but slightly anxious about the cropped length on the ahem larger lady. Just concerned that it’s going to make me look even wider than I already do, but I am putting my trust in you!